The UNDP NDC Support Programme is hosting a webinar series on mainstreaming gender equality within Nationally Determined Contributions (NDCs). The second session will focus on gender data and indicators in the NDC process, showcasing various country examples. 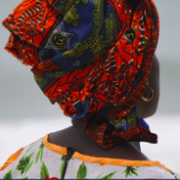 Listen in to this webinar to understand the practical value of gender data and indicators to achieve development outcomes. 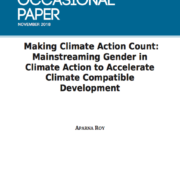 This paper argues that optimising development co-benefits from the simultaneous implementation of Sustainable Development Goals (SDGs), such as goal 5 on Gender Equality and 13 on Climate Action, is an essential and powerful solution for the success of the Paris Agreement and 2030 Agenda. 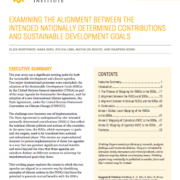 This working paper explores the extent to which the two agendas are aligned in a concrete way by identifying examples of climate actions in the INDCs that have the potential to generate mutual benefits with the SDGs. 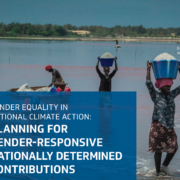 This report provides an overview of progress to date, including challenges, gaps, and opportunities in the integration of women’s empowerment and gender equality into national climate policy and action—particularly as countries begin implementation of their Nationally Determined Contributions (NDCs). El segundo webinar de la serie de GECCO Energía para Latinoamérica tiene como objetivo plantear la base para entender algunas de las medidas de mitigación existentes, la forma en como estas pueden colaborar a los compromisos nacionales y la manera en la cual es posible integrar las consideraciones de género en su desarrollo.